When it comes to conservation on Jeju, the closer management is to the roots of the village pongnang nettle tree, the healthier the results. The fruits of such an approach are evident in one of Jeju’s most iconic villages, Seonheul 1-ri, Jocheon-eup. In the middle of Jeju’s Jungsangan mid-mountain region, Seonheul effortlessly blends symbols of modern Jeju — coffee shops, artisans, guesthouses — with a rich island heritage. For nature lovers at least, the village is best known for its volcanic gotjawal woodland, which contains Dongbaekdongsan forest, inside of which you can find the beautiful Meonmulkkak wetland. The Dongbaekdongsan region was designated a Ramsar Wetland in 2011 as a precious groundwater site within Jeju’s gotjawal forests. It is internationally important for its biodiversity and unique lava bedrock composition. It is one of five Ramsar Wetlands on Jeju, and its geological importance was also confirmed through its designation as a Jeju Geopark Site in 2014. Management at the site is a joint effort between the government, the community and conservationists, one of whom is Ko Je-ryang, president of the Jeju Ecotourism Association and a veteran activist on Jeju Island. Ko first arrived in the village in northeast Jeju to provide training on wetland management and increase awareness of the opportunities that Ramsar - the world’s most prestigious wetland designation - could bring. She spent extended periods in the village in the lead up to the designation, and her hands-on approach was evident from the get-go as she engaged with some locals who were fearful about the consequences of Ramsar status. “Some in the area feared that conservation status would limit development opportunities and land prices. I listened to villagers and explained that conservation is actually an opportunity for sustainable village development, not a threat,” said Ko. The goal of Ramsar is not only conservation, but wise use of wetlands, and once Ko had explained the opportunities it would bring, the response was unanimous: “Let’s do it!” they told her. Four years later, in 2015, a Wetland Center was completed. Ko visited wetlands across the country to learn from best practice and brought back her proposals to Jeju. “The villagers agreed on the center, but insisted on giving it a Jeju flavor,” she said. At the superficial level, the Jeju touch can be seen in the slender, flowing roof which drops down into an artificial pond to hold water runoff. “It was designed by the villagers. The roof symbolizes a lava flow and the pond is both an artificial wetland and education area for children. Villagers drew it up and then we sent it off to a local architect,” said Ko. More substantive local influence is in the management of the site which locals do on a day-to-day basis through the Seonheul 1-ri Eco-tourism Association. Ko says that although villagers wanted to completely control affairs, specialist expertise is often required, at which time Ko and Jeju City officials take the lead. 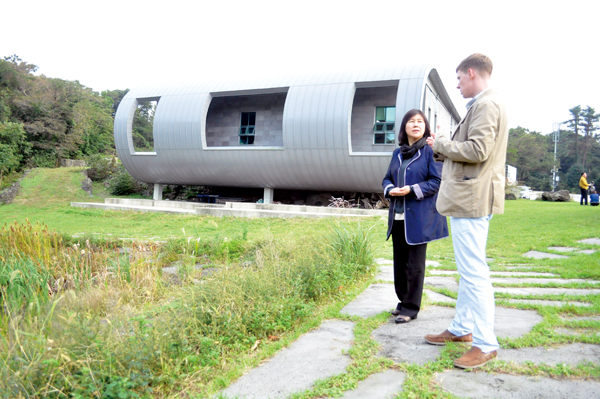 The Jeju-born conservationist says that it is the villagers’ love for the wetland itself that makes the project so special. She emphasizes this through the center’s two simple goals: “conservation of the wetland, and the happiness of villagers,” she said. Even to this day, the wetland provides for villagers physical needs through groundwater and forest products, and it also performs a spiritual role, protecting villagers from harm. There is both a shamanic shrine and a Confucian altar bordering the gotjawal woodland, and the Ramsar designation complements this spiritual connection between villagers and the natural world. With its core community focus, the center itself exudes practical function with a large education/exhibition room, a large kitchen/dining area, a shop selling forest products and souvenirs, and an administrative office. The center also allows for more events to be held in the village. In late September an “Eco Party” organized by the Jeju Tourism Organization was hosted with a guided tour of Dongbaekdongsan, an acorn noodle soup lunch, live music, and plenty of local children running wild. Having such fervent local participation is important to Ko, who got involved in ecotourism to educate people about the value of conserving nature. The center contributes to this through bi-monthly education sessions on topics such as eco-friendly agriculture, food, and ecotourism. The center is such a success that visitor numbers to the wetland have shot up from 9,000 in 2014 to 17,000 in 2015 and a projected 25,000 in 2016. In what could be seen as a big pat on their own back, Seonheul villagers even pioneered the Ramsar Wetland City accreditation last year. Although the system is very much in the incubation stage, the Wetland City accreditation recognizes local communities for their engagement in conservation. The benefits might include village branding and use of the Ramsar logo on local products. There could also be more funding from the Ministry of the Environment for training and education of locals. “Ramsar designation is focused purely on conservation. The Wetland City designation is an incentive to recognize the effort of locals in preserving their local wetland,” said Ko. She said that the scheme had attracted the attention of Ramsar officials who visited the village and expressed an interested in spreading the Wetland City concept around the world as a model. “Seonheul is a really influential site within Ramsar,” said Ko, succinctly summing up the success of the village’s efforts to preserve Jeju’s precious wetland habitat.